Sometimes you just need a relatively light game in between heavier fair, so you turn to one of those games affectionately known as ‘filler’. 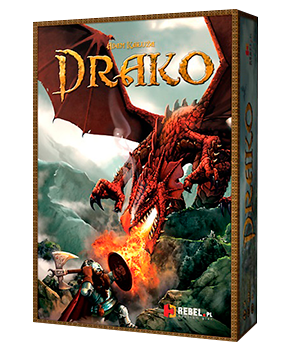 Infiltration is probably my favourite game in this category, but with just two players and even less time to spare, Drako is an excellent alternative. It’s a very nicely produced asymmetrical game that doesn’t overstay its welcome. One player plays three dwarves, the other the dragon. You play cards that let you move, attack, block, breathe fire, throw a net, etc. The dragon wants to stay out of the way of the dwarves so it can unleash its fiery breath; the dwarves want to hem the dragon in and reduce its capacity to fly and breathe. Whoever gets killed loses! Nice artwork, great little miniatures, straightforward rules, a fun theme (though perhaps slightly disturbing for animal lovers) – what’s not to love? The perfect filler for two players.